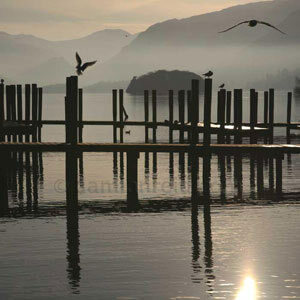 "A cold, but beautiful November day in Keswick (2008). Mist was forming over the lake as the sun lowered in the west. I could the hear voices of people enjoying themselves very near me, which seemed to enhance the peaceful atmosphere at the boat landings. I watched the gulls closely, waiting for the right moment to capture their movements. "